It was the beginning of December 2013 when the first forum messages appeared on the HebWeb about the proposed supermarket on the former Fire Station site. Since then, local campaigners have been working hard to resist Sainsburys being foisted on our town. 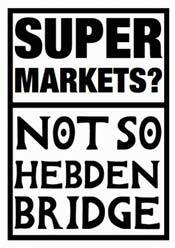 This morning, our local Calderdale councillor Dave Young was able to inform the HebWeb that Sainsbury's have finally lost. Their appeal against the refusal of planning permission by Calderdale Council has been thrown out. A Jordan, the Planning Inspector, states that "the main issue for the appeal to be the effect of the proposal on highway safety, including the loss of parking." "It would also lead to a small but nonetheless significant loss of on street parking. This would exacerbate existing parking and congestion problems and would impede the free flow of traffic, causing inconvenience to road users. It follows that the proposal would conflict with policies BE5 and S2 of the Replacement Calderdale Unitary Development Plan as it would fail to provide for the safe and free flow of traffic. It would also conflict with guidance within the National Planning Policy Framework (the Framework) which seeks developments which accommodate the efficient delivery of goods and supplies." The Inspector rejected many of the arguments of those opposed to the supermarket even though she noted "the strongly felt views of many in the town on the matter". The Inspector went as far as to say that "having regard to the close urban grain of the surrounding streets, and the character of surrounding buildings within the Valley Road and Hangingroyd Lane Character Area, I am satisfied the proposal would preserve and enhance the character and appearance of the Conservation Area." Finally however, the Inspector concluded that the effect of the proposal on the local highways network would also be significant and harmful. She therefore arrives at the opinion that on balance, the harmful effects of the proposal on the local highway network outweigh the potential benefits of the scheme. See below for links to the extensive news and discussion of the issue as it appeared on the HebWeb over the past eighteen months.